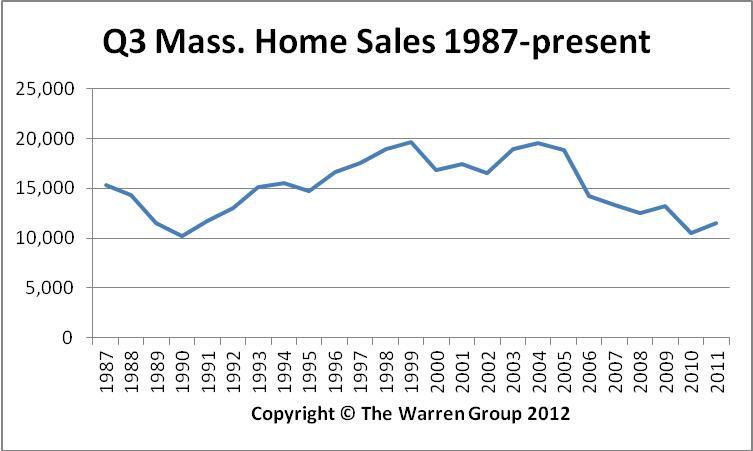 Massachusetts single-family homes sales increased again in September, while prices slipped back below $300,000, according to the latest report by The Warren Group, publisher of Banker & Tradesman. The median price of single-family homes dropped 4.5 percent to $277,000 in September, down from $290,000 a year earlier. This is the first time since May that the median price statewide dropped below $300,000. Third quarter median prices held stable – dropping just 0.6 percent to $301,250 from $303,000 in the third quarter 2011. The median price for homes sold January through September was $290,000, down 1.6 percent from $294,700 in the prior year. In September, condominium sales statewide rose more than 23 percent to 1,609, up from 1,306 a year ago. Condo sales in the third quarter increased 33 percent to 6,024, compared to 4,529 during the third quarter 2011. Year-to-date condo sales are up 27.5 percent, soaring to 14,641 from 11,479 during the same period last year. The median condo price held steady at $275,000 in September, a 0.16 percent drop to $275,450 a year earlier. Third quarter median prices are down 3 percent, decreasing to $281,000 from $290,000 in the prior year. The year-to-date median price of condos in the Bay State is $279,000, up 1.5 percent from $275,000 a year ago.